HTC has launched a new flagship Android smartphone, the HTC One X, at the Mobile World Congress in Barcelona. The majority of mobile giants had their announcements before the actual start of the MWC – including Samsung, LG and Sony. HTC had the last, and perhaps the most glamorous event of the day, held in a huge rounded dome at the top of the Cúpula las Arenas next to Fira de Barcelona, where the main conference is held. The device also brings a vastly improved camera experience, called Image Sense. The camera takes photos quickly — in 0.7 seconds. It has 8 megapixels and uses an f/2.0 lens, which captures more light than any other HTC smartphone camera. It also takes great photos in unfavorable light conditions, thanks to the device’s HDR algorithm. An on-screen comparison with the photos taken with an HTC One X and an iPhone 4S portrays HTC’s device as a clear winner, but we’re sure Apple will have a word or two to say about that. HTC is bundling a bunch of extras with the device: 25 GB of free Dropbox-powered storage, Beats Audio sound (HTC acquired Beats Audio in August 2011) and a feature called Media Link, which takes your photos and videos from the smartphone to the TV (through a special gadget that connects to any TV) with a three-finger swipe on the smartphone’s screen. 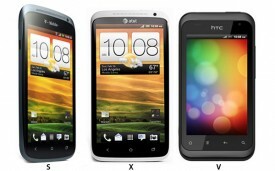 The company also launched two other HTC One devices with slightly lower specs – the HTC One S and the HTC One V.